Have you ever wondered if you can recycle paint cans? Have you ever wondered if there are creative ways to reuse paint cans? Well, I sure have. I have a stack of paint cans at my house, many still with a bit of paint left inside, and I need to do something with them. Years ago when I had this situation come up, I called my local city services to see what to do with the paint cans. Their advice was to fill the paint cans with kitty litter (to soak up the excess paint), and then put them on the curb for garbage pick up. I’m sad to say I did just that (this was before my awareness of green). But now? Now I have the same situation: a pyramid of paint cans. But the thought of putting all those metal paint cans in a landfill just makes my blood run cold. So I’m wondering…paint can are made of steel. Can’t you recycle them? Can you reuse them? That’s what I aim to find out today. And like I usually do, I decided to write a post while I learn about it myself! A quick search on Google yielded a good result from one of my favorite blogs, Daily Danny. If you haven’t heard of Danny Seo and you’re interested in learning green frugal ways to decorate your house with style, then head over to his blog. It rocks. Anyway, Danny had the same problem last year: tons of paint cans. He called Benjamin Moore paints, who told him that most cities should be able to recycle the paint cans as long as the paint is completely dried out. You can see his original article here. paint cans, aerosol cans are recyclable, but are considered hazardous waste and need to be kept separate from other metals. It is important to leave labels on these cans, as recyclers need to know the former contents. Try to return the lids along with empty paint cans. Ok, sorry if I’m beating this thing to death, but I just found another great piece of information at Paint.org. Here’s what they have to say about recycling paint containers. Since all paint and aerosol containers are composed of high-grade steel, they can be recycled in a steel can recycling program. Paint containers made of Polyethylene Terephthalate (PET resin SPI code 1) and High Density Polyethylene (HDPE resin SPI code 2) plastic are also recyclable in many communities. Check with your local/state government to determine whether steel and other materials may be recycled in your community. 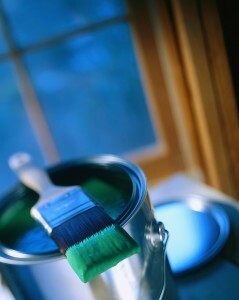 To recycle paint containers, make sure they are empty and dry. A thin layer of dried paint on the bottom and sides of the can is usually acceptable. In order to recycle paint can lids, just remove them from the container. To recycle empty aerosols, do not puncture, crush or incinerate the can. You do not have to remove the nozzle of the spray cans for recycling, but do remove the aerosol caps, which are generally made of plastic. If you’d like to get crafty and reuse your paint cans (which is what I’m going to try to do), what the heck can you do with them? Well, there are a gold mine of ideas. Clean out several paint cans so they’re free of paint. Decorate each one. You could use wrapping paper, old wall paper, or even paint them. You can also line the inside with paper or cloth if you’d like. Using a hot glue gun, glue the paint cans together on their sides, creating a pyramid form, with all the openings facing the same direction. You can also use strips of Velcro. Use your pyramid to store office supplies, or kitchen things like cloth napkins, extra silverware, art supplies, etc. Martha Stewart did this (of course!) and she has a great picture on her site here. In her project, she’s using paint cans to store her mail and mgazines. You can also use this idea on the wall, so instead of glueing these paint cans together for a desktop organizer, you could nail the bottoms to the wall. These are great for storing hats and mittens when you walk in the door. They also work great for storing fabric scraps for sewing and quilting. You could nail the paint cans horizontally, leaving space in between each one, vertically, or even do a wavy design. A classic idea. Clean out your paint cans, and use them as flower pots! Because they’re steel, you might want to put a plastic liner on the inside. ThriftyFun.com has a short tutorial on how to do this. I found some really snazzy paint can banks online. People are so creative! This would be a great project to do with kids. Let them decorate their paint cans with construction paper, paint, or even natural things like leaves and rocks, and then you cut a hole in the lid to drop their coins through. Do you have any creative suggestions for reusing paint cans? I think I’m going to turn some of mine into flower pots. I’d love to do with “cubby on the wall” project, but I’m moving as soon as my house sells and don’t want to have to pry them off the walls. Anyway, if you have any ideas please chime in! I’d love to hear them. We are doing cubbies but we are lining them up, square and wrapping them with duct tape. Then decorating. this way they aren’t attached and we can make a wall unit.